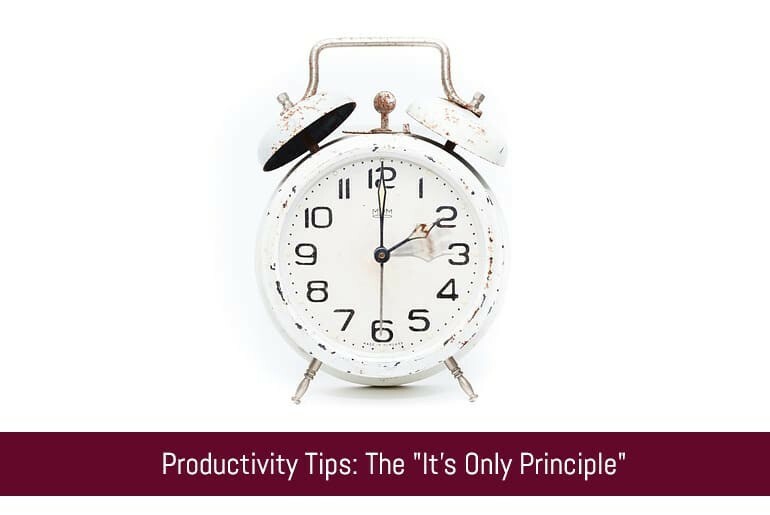 Productivity Tips: The "It's Only Principle"
How many times have you put off doing something because you thought “On, No!” about it? Quite a few I reckon. It may be one of the feelings above, a combination of them or something completely different that makes you think “Oh, No! I’m not going to do that!” which leads to procrastination and a whole host of missed opportunities. How about I give you a personal example to show you what I mean? For the past few years I’ve been suffering from a bad back – it’s reasonably okay now but every now and again I have a problem so after a bit of research I decided I should do some Pilates. I bought a couple of books but you know what it’s like when you try to exercise at home: you’re really enthusiastic in the first week, do slightly less in the second week and by the third week you’ve forgotten about it completely. Not long after my failed attempt a friend of mine told be she attended a local Pilates class and invited me along. The list of negatives (and excuses) went on and I won’t bore you with them but I’m sure you get the picture. That made me stop and think, and then I had a ‘light bulb moment’. And I’m still going 6 months later! I now apply the “It’s Only Principle” to other areas of my life. If I’m not sure I really want to do an overtime shift at work I’ll say to myself “Katy, it’s only four hours” and if I think “Do you know what, you’re right” then I agree to do it. If I’m unsure about going out somewhere I’ll apply the “It’s Only Principle” – “It’s only a couple of hours” I’ll say to myself and if I feel okay about spending that time on that activity (which I usually do) then I’ll go. On the odd occasion I don’t feel like taking part and the prospect of it only being “x” hours isn’t appealing because I have considered it I don’t feel bad about saying no. We’re often told we need to be looking at “The Bigger Picture” in order to make judgements on what course of action we will take. Sometimes though when we look at the big picture it’s really easy to get overwhelmed, this cab cause huge amounts of stress and anxiety and can put you off your task completely. Using the “It’s Only Principle” we can take these big picture items and break them down into smaller and more manageable chunks of time or actions. I’ve written in the past about how chunking tasks can be a real boost to productivity but let’s take a real-world example to show how we can use chunking along with the “It’s Only Principle”. Spec design options – that’s only an hour too! So rather than seeing a massive 5 hour chunk of work the most you’ll see is a single hour for one task. Don’t think that the “It’s Only Principle” is just for motivating you to spilt and manage tasks more productively, it’s also a fantastic motivational tool as well. Take my earlier example about hesitating to join a (much needed) Pilates class. I could have said “No!” but instead I said “It’s only an hour” and off I went. The “It’s Only Principle” is great for getting you over that initial hump of resistance that I’m sure we all feel when starting something new. We all go through that period where we loathe starting something but once we do finally get going we tend to feel a lot better about not only the activity but ourselves too. Quite often once you start a task you will then continue on and work through others, you’ll then feel even more motivated. Before you know it you’ll have checked off a load of items on your to-do list. Using the “It’s Only Principle” can get you started, and that small achievement will have a big effect on your productvity, motvation and general sense of Accomplishment. This general sense of achievement will have a big impact on your mental health, making you feel better about yourself and more willing to start more things therefore creating a fantastic circle of motivation. Whilst the “It’s Only Principle” may seem rather simplistic, I think that’s where its strength lies. You can apply it to so many aspects of your life – whether that be getting started on a big project, starting a chore you’ve been putting off for ages, exercising, cooking a healthly meal rather than opting for take-out or even going to the cinemam it lends itself to be a motivating force across so many areas.